I’m a huge fan of salmon. Whether it is baked, grilled, or smoked, there is something about the texture and flavor that keeps me coming back for more. On a recent stop at my local grocery store, the butcher had asked if I checked out their salmon as it was on sale, and was going fast. I was quick to respond and decided to pick up over a pound of a salmon filet. The color was perfect and it smelled fresh, so I went all in. I typically coat my salmon in mustard and use various spices, but this time I decided to try another approach and go with a barbecue based rub, and holy moly was it ever good. This recipe is way too easy to make, and not only does it yield quite a bit to feed several people but it is delicious to boot. Yep, that’s it. Simple. Delicious. Nutritious. Add parchment paper to a baking sheet (I find it much easier for cleanup). 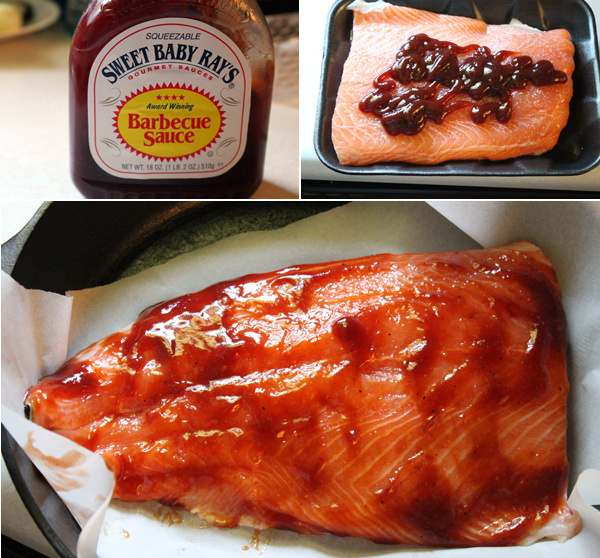 Take the salmon filet, skin side down, and rub it all over with your favorite barbecue sauce. I used Sweet Baby Ray’s as it was simple, and not too spicy for my family. Let this set in for about 15 minutes, then place the onto the baking sheet, and bake for about 35 minutes, or cooked until the right temperature, about 145 degrees internal. Once you hit 145 degrees, remove from the oven and let the salmon rest for about 10 minutes before digging in. This salmon was irresistible and my youngest daughter could not resist. I think she even ate this for lunch, and dinner! Yes, it was that good. 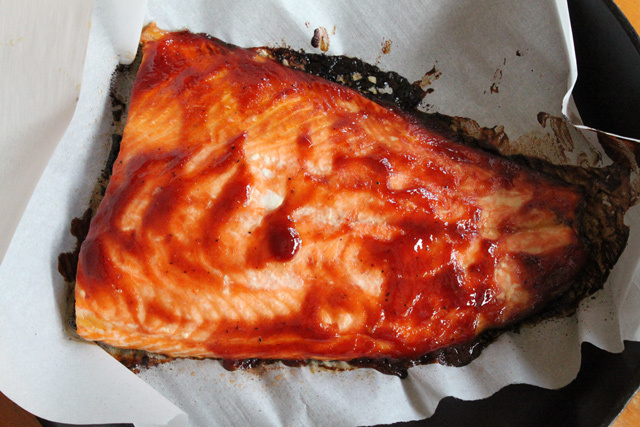 If you are looking for a simple salmon recipe, give this one a shot. Hope you enjoy!